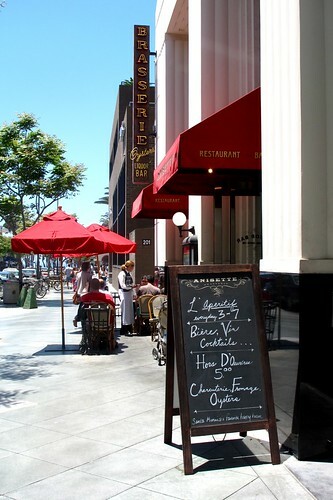 Last Sunday, I found a little bit of Paris in Santa Monica. It was the closest I've come to feeling like I'm in Paris again. Before my Parisian brunch at Anisette Brasserie, my only substitute for the ambiance of the city of lights was listening to sappy French love songs while sipping on a cappuccino at Le Pain Quotidien. 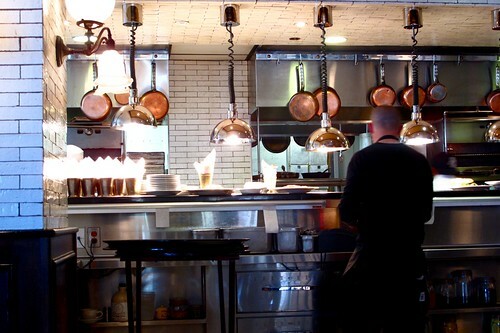 Trust me, the experience at Anisette is a lot more satisfying. 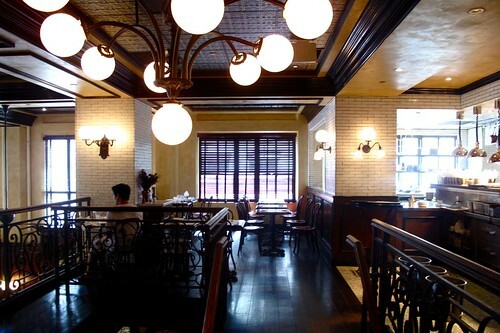 From the moment you enter the brasserie, just off Santa Monica Boulevard, the red-cushioned stools and dark wood paneling of the belle epoque design instantly transports you to a bustling brasserie off the boulevard Saint-Germain. 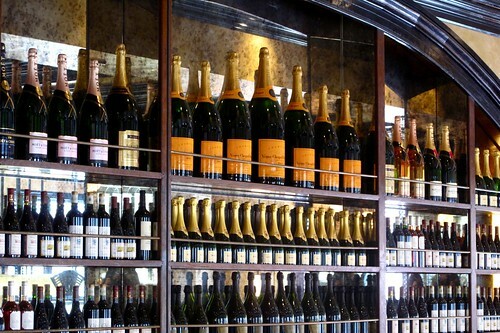 The ceiling-high wall of liquor, icy raw bar, and overflowing basket of freshly baked croissants only adds to the enchantment. I caught myself wanting to ask for a table in French. Even better, the food was great. It was everything you'd expect at a brasserie. In fact, it was better than some of the variations I had in Paris. 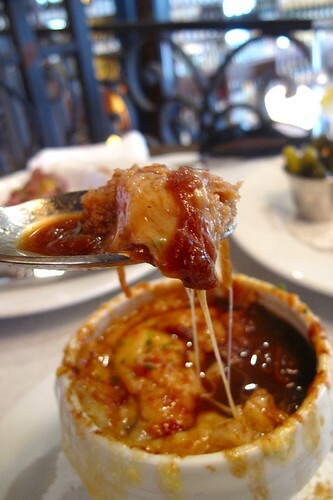 Comforting plates of food, cheesy when it should be, creamy when it needs to be, and arriving just when you want it. 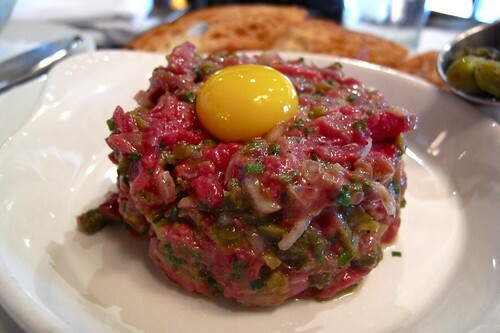 This is probably the best steak tartar I've ever had. 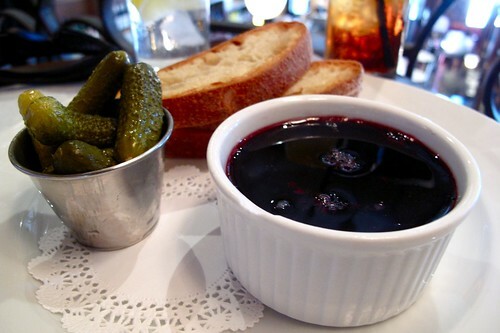 I hate to say it, but it was even better than the steak tartars I had in Paris. It was immensely flavorful--tangy from the vinaigrette with tiny pieces of shallots, capers, and chives mingling with the hand-cut steak. The texture was amazing--not at all mushy or unappealing. The quail egg yolk not only made the presentation beautiful, but also added a nice rich, slightly creamy taste to the tartar. 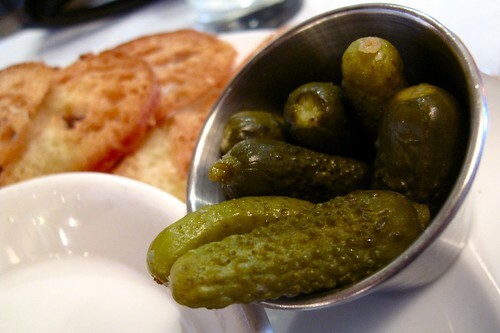 The side of cornichons added a nice acidic touch and crunchy texture. It was just so delicious. 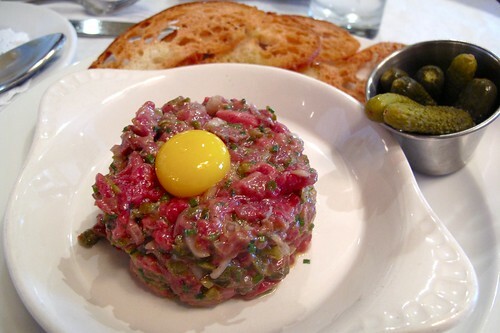 I would return to Anisette just for an order of this steak tartar. 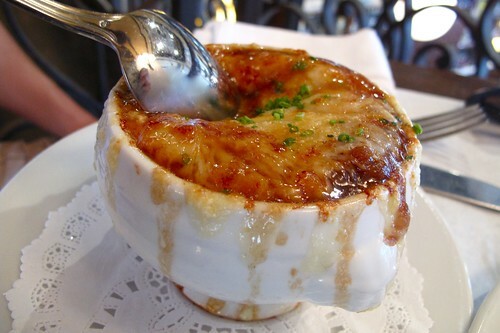 I'm a big fan of French Onion Soup and this was one of the best I've had in a really long time. 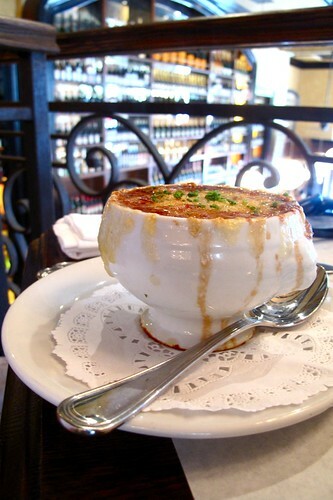 You can tell a lot about a restaurant based on the onion soup it serves. I've had so many that are too watery, too salty, or too sweet that I've actually become a little apprehensive about ordering one. Anisette's onion soup was a masterpiece. 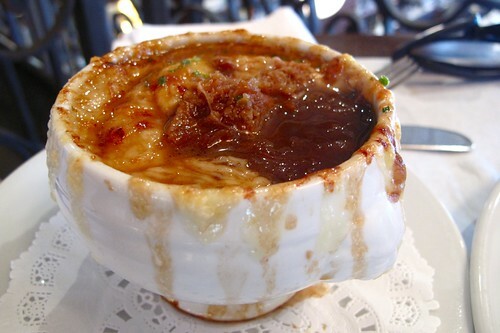 The broth was deep and rich, the onions perfectly caramelized and sweet, and the cheesy was stringy and gooey, while the pieces of bread soaked up all the delicious flavors. Sadly, my attempt at introducing pâté to the bf did not work out too well. He was not a fan. However, I happily ate the entire thing. It was good--the gelée added the seemingly requisite sweet component in the creamy foie gras parfait--but the liver flavor was actually not prominent enough for me. As a side note, I learned that no matter how much I love pâté, it is actually not an easy feat finishing off an entire order of it by myself. This is the reason why I chose to brunch at Anisette on Sunday. They only make these chocolate croissants on the weekends. 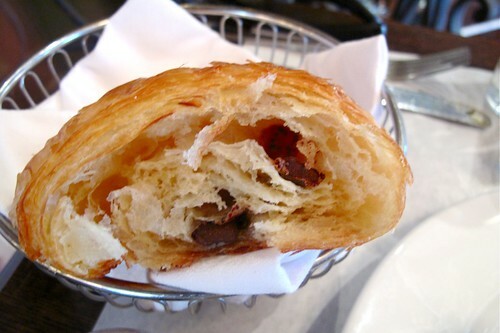 And I came to the conclusion that the pain au chocolat is indeed reason enough to visit Anisette during the weekend. It was very good. Wonderfully flakey and butter with two batons of intensely chocolate-y chocolate hidden inside. 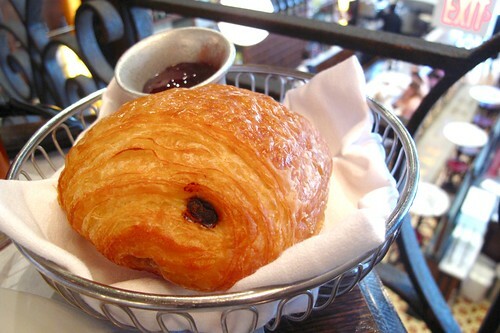 However, this pain au chocolat did not manage to surpass the ones I had for breakfast almost every morning in Paris--but that's to be expected. Out of everything we had at brunch, this is the only dish that I was slightly disappointed in. Up until this point, it had been delight after delight--each dish exceeding my expectations. However, I found this croque monsieur to be a little dry and a little too...neat. 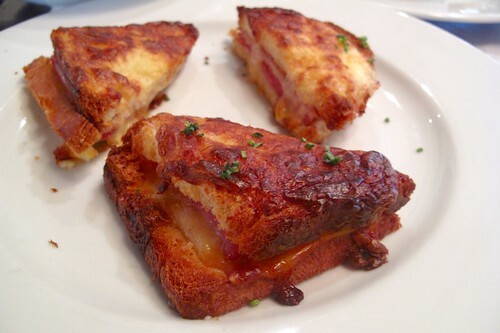 I want my croque monsieur gooey and dripping with melty cheese. 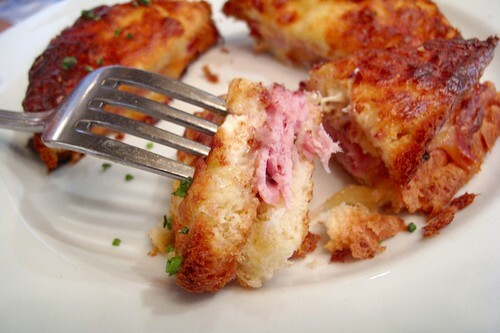 The jambon (ham) was also a little too thick and dry in my opinion. Maybe if we had gotten the croque madame, the fried egg yolk would've helped a little. 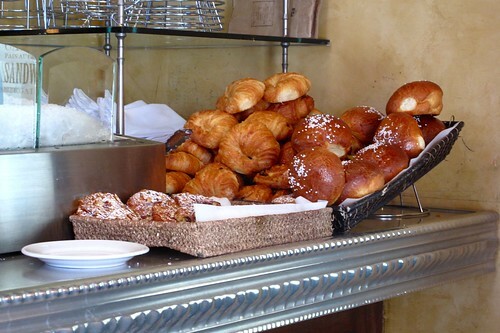 However, the house-made brioche was indeed very light and fluffy. I ordered this salad simply because I needed something to cut all the carbs and fat in this meal. 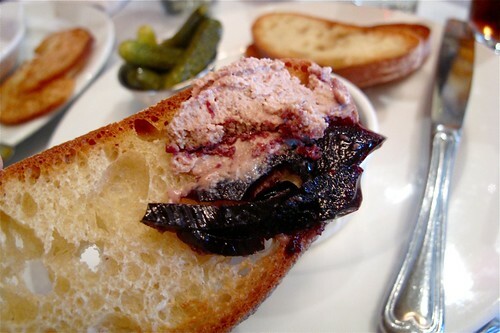 I think I ate an entire loaf of bread with that pâté. The salad, on the other hand, was a little lighter. 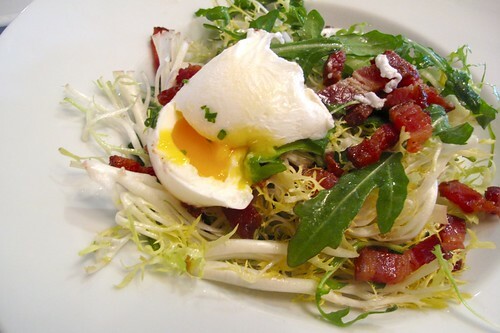 I love how the broken egg yolk mixed with the dressing and coated the frisée. By this point, I didn't even really need the pieces of pancetta lardon. Classic and very enjoyable. 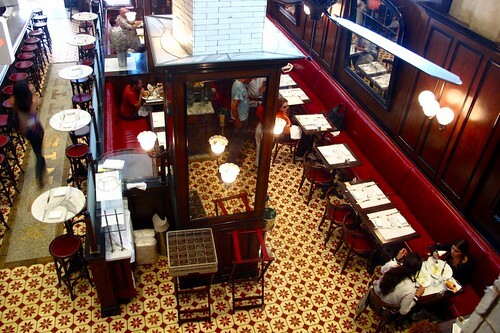 We also had the best seat in the house--on the second level, overlooking the row of red booths, busy servers in black and white delivering hot plates of food, and right next to the kitchen sending out orders of steak frites with tall cones of fries that incited some food envy. 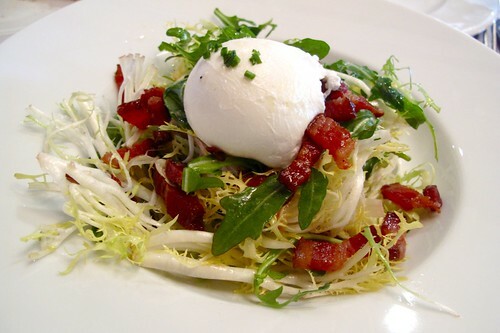 Been so wanting to go to Anisette. Looks wonderful, true to its reputation (especially the pate- love the stuff)! I went for brunch once and liked it but didn't love it. Maybe I should try again. ahhh paris. the quickest way for me to travel anywhere nowadays is to do pretend trips in l.a. :( this place looks fantastic. I am SOLD on this place. Gorgeous photos, Christina! 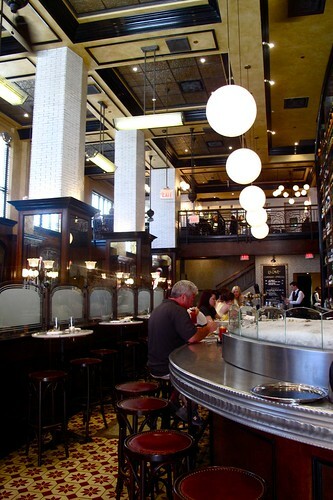 So close to me, but haven't been.. that steak tartar and french onion soup look AMAZING!! @Anon: That's hard to believe since the service was still impeccable!